Urbanimals are a playful pack of origami-like wild beasts who appear in unexpected places across the city, waiting for people to play. Dolphin likes to leap together, rabbit is very shy, beetle tries to get his job done whilst cheeky kangaroo is up for some skipping. Triggered by people passing or stopping, this magically interactive project uses projectors and sensors and stretched across the whole city. Urbanimals was the winner of the 2015 Playable City Award. It was created by the Laboratory for Architectural Experiments, LAX, based in Poland and produced by Watershed with support from Arts Council England, British Council, Bristol City Council, Invest Bristol and Bath, University of Bristol, University of the West of England, Future Cities Catapult and Guardian Cities. Urbanimals is a touring work and is available to host in your city. 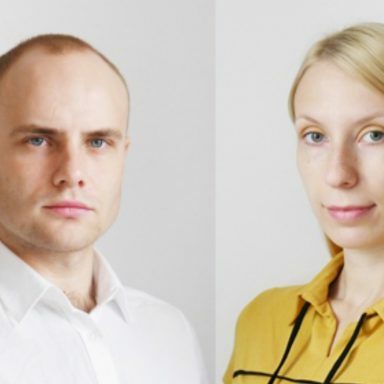 Anna Grajper and Sebastian Dobiesz make up LAX, an experimental design team based in Poland.